An established ladies networking club in Worcestershire are going to be holding a Showcase event at a local luxury hotel to help promote their member’s businesses. Wednesday Club are going to be holding the Showcase event at The Elms in Abberley on 12th September from 5.30pm. The event is being organised to give ladies the opportunity to market their business, expand business connections and discover new ways to grow their business. As well as showcasing their own businesses, ladies attending the event will also have time to enjoy a buffet meal and given the opportunity to look around the recently refurbished hotel and spa facilities. A raffle will be held during the event with all proceeds going to the Club’s nominated Charity at this event, Funny Blood a good cause set up to raise awareness of rare blood conditions in children. Any raffle prize donations would be welcomed. 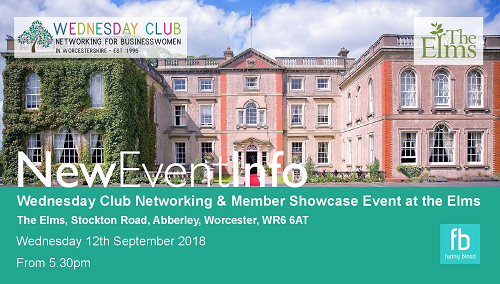 Wednesday Club would warmly welcome any female business professionals to attend the showcase event in a friendly environment with costs being just £15 for members and £20 for non-members. A welcome drink and buffet is included in the price. To book your place call Wednesday Club Event Organiser Andrea Palmer on 07786 437189 or email: meetings@wednesdayclub.org.uk.